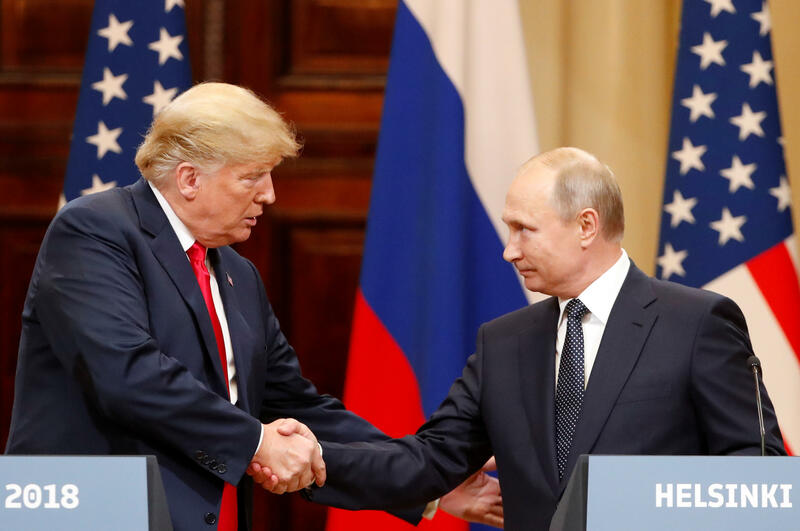 WASHINGTON -- Capping a week of drama, back tracking, a double negative and blistering statements from allies about his attitude toward Russian election interference, President Trump on Sunday was back to referring to "a big hoax." Mr. Trump spent days trying to reassure the country that he accepts that the longtime foe interfered in the 2016 election after his public undermining of U.S. intelligence agencies in Helsinki while standing alongside Russian President Vladimir Putin. But Mr. Trump cast doubt once again in a Sunday tweet, diminishing at least the significance, if not the existence, of the interference and the U.S. investigation into Russia's actions. "So President Obama knew about Russia before the Election," Mr. Trump tweeted. "Why didn't he do something about it? Why didn't he tell our campaign? Because it is all a big hoax, that's why, and he thought Crooked Hillary was going to win!!!" It was not immediately clear whether Mr. Trump was suggesting that the entire notion of Russian interference -- U.S. intelligence agencies unanimously concur it took place and Mr. Trump reluctantly accepted their assessment amid the firestorm -- was fraudulent, or just the investigation of potential collusion by Mr. Trump associates with Russian agents. Either way, it appeared to keep alive a controversy that had separated Mr. Trump from aides and longtime political supporters and brought some of the most striking rebukes of his tenure in the Oval Office. "The evidence is overwhelming and the president needs to say that and act like it," said Republican Rep. Trey Gowdy, the chairman of the House Oversight Committee, in an interview with "Fox News Sunday" aired hours before Mr. Trump's tweet. Two Mr. Trump associates, former national security adviser Mike Flynn and campaign foreign policy aide George Papadopoulos, pleaded guilty last year to charges brought by special counsel Robert Mueller alleging they had lied to the FBI about their Russia contacts. Mr. Trump's latest missive came hours after he asserted without evidence that newly released documents relating to the wiretapping of his onetime campaign adviser Carter Page "confirm with little doubt" that intelligence agencies misled the court that approved the warrant. Mr. Trump tweeted Sunday on the documents: "As usual they are ridiculously heavily redacted but confirm with little doubt that the Department of 'Justice' and FBI misled the courts. Witch Hunt Rigged, a Scam!" Republican Sen. Marco Rubio of Florida also broke with Mr. Trump, saying he didn't think the FBI did anything wrong in obtaining warrants against Page. Rubio on Trump's messaging on Russian meddling: "Not a good moment for the administration"
When asked if the information collected from Page using a FISA court order was justified, Rubio told "Face the Nation" moderator Margaret Brennan that the FBI had "reason to believe" Page was a person of interest given his openness about his contacts with Russians. Rubio on Trump messaging on Russian meddling: "Not a good moment for the administration"